This small kiosk serves a wide variety of wholesome foods ranging from smoothies, shakes and juices to grilled sandwiches and baked goods, all of which are convenient to eat on-the-go. Their speciality would be the JUJU bowls—essentially acai bowls, these desserts are all 100% plant-based, vegan and refined sugar-free. Available in several flavours such as the classic Acai, Dragon and Chocolate Oat, there’s surely something for everyone. We opted for a regular Acai JUJU bowl (S$8.50 for regular, S$9.50 for large). Their rendition of the classic Acai bowl consists of a generous helping of Acai which is complemented by house-made chia seed pudding, Medjool dates and a variety of fruits. Their acai has an icy texture similar to that of a sorbet, as compared to other acai bowls that possess a thicker consistency. However, the acai impressed us with the intensity of flavours despite its texture—neither diluted nor overly sweet, their JUJU bowls surely make for an ideal, cooling treat. 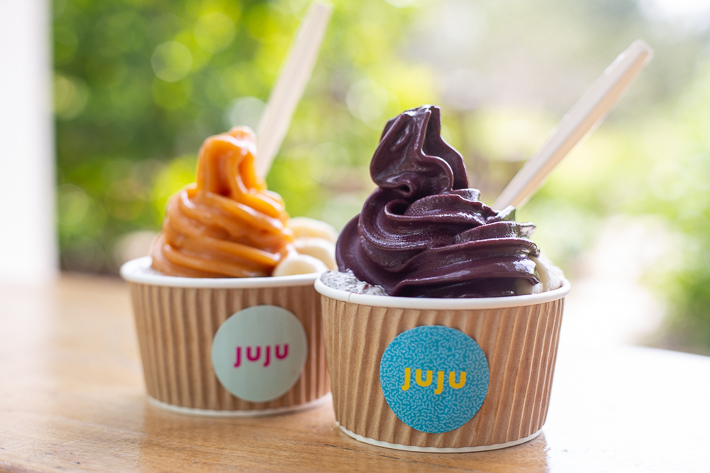 Depending on the season and time of the year, JUJU sometimes crafts out festive flavours for their acai bowls. To usher in the Lunar New Year, the café has come up an all-new flavour, Mandarin Orange Acai Bowl to entice their guests. Priced the same as the usual acai bowls on the menu, the Mandarin Orange JUJU bowl was one we thoroughly enjoyed. Topped with a bunch of healthful ingredients including bananas, blueberries, granola and mulberries, their Mandarin Orange had a refreshing tangy taste which we felt was a great representation of the fruit itself. This festive flavour would be around until the end of Chinese New Year. Considering that they nailed this festive flavour, we’d definitely be keeping our eyes peeled for their next seasonal flavour!